I am going on a work trip tomorrow and I am so excited! I'm going to miss my family but a couple days away where I can learn about a brand and meet other bloggers sounds wonderful. I have a love/hate relationship with taking an airplane. First of all, I don't do it often so when I do, it is pretty exciting. I love walking around an airport and seeing all of the restaurants and shops. I love the takeoff and watching the clouds. What I do not like is having to wait forever for a flight with possible delays and all of the germs and possible illnesses that you could get. My kids already had one cold this year and Troy and I had a super minor cold so I know that cold and flu season is here early this year. I wanted to share my tips for healthy travel during cold and flu season. In an airport, people put their hands on everything meaning that there are germs everywhere. Washing your hands regularly can help prevent illnesses. This Greek Orzo Pasta Salad would pack really well! I sometimes like to get food at the airport but find that I feel my best when I pack my own meal if I am going to be traveling during a mealtime. I like to bring either something like a salad, fruits and veggies, a sandwich, protein bars, etc. If you don't want to pack a meal or cannot, I recommend searching around for a healthier airport option. Most airports have some healthy foods available. For any trip we go on, I like stock our bags with essentials in case you get sick. When we go somewhere such as up north, there is often not many stores around to shop at so it is much better to just pack what we need ahead of time, especially if someone gets sick in the night! I love traveling with tea because I love tea and have been drinking the Lipton* Bedtime Bliss Herbal Supplement for about a year now. You can drink it anytime, not just when you're sick. It is made with chamomile, orange peels and mint and is caffeine free so you can drink it before bed. It is part of the Lipton Wellness range made with botanicals and essential oils. help so much to keep my skin soft. I like Kleenex because it's dependable care and ultimate softness. Kleenex is offering free home delivery from 9/4-11/11/18. Check your in-store circular for the 11/4 coupon for .50¢ Off Kleenex Facial Tissue or Wipes. 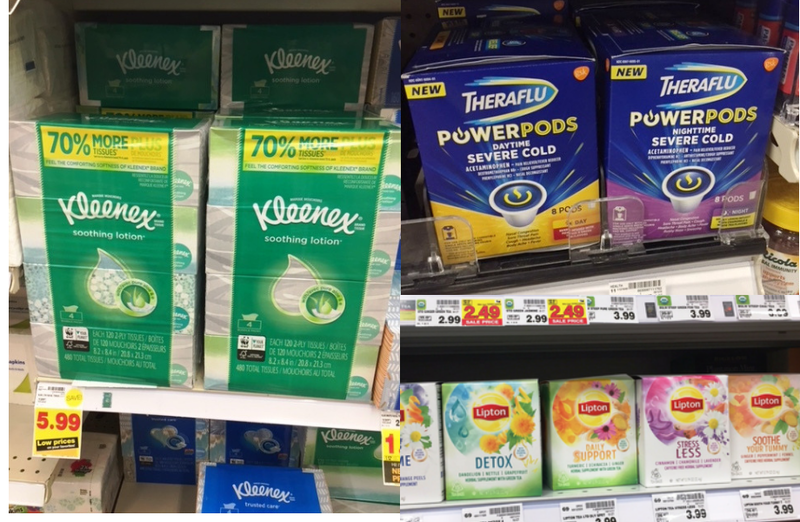 And, 11/4-11/24 you can get .50¢ off Kleenex 4-pack bundles and Kleenex Wet Wipes via this digital offer. aches and pains, headache, congestion, throat pain and temporarily can reduce a fever. I picked up all of these essentials at Kroger. We love shopping at Kroger and I have literally been there 4 times in the last week for different reasons. I love the variety of products and lately, their prices have been a lot more affordable as well! There is something about travel that can be dehydrating. I always pack an empty water bottle that I fill up once I get past security. I also typically treat myself to a coffee or tea at the airport for a boost of caffeine, some warmth and it keeps me hydrated. get in some exercise if you are wearing the right gear. Also, I love sightseeing on a trip and highly recommend building exercise right into sightseeing. It is so easy to walk somewhere that you want to check out and you kill two birds with one stone. that I want several snacks, I make sure to bring my own. What are your favorite healthy travel tips? For more healthy travel tips and ways to stay healthy this season visit here.